Will Hurricane Hector hit Hawaii? This satellite image provided by the National Oceanic and Atmospheric Administration shows a view of Hurricane Hector, Tuesday, Aug. 7, 2018. A tropical storm watch was in effect for the Big Island as Hector was expected to pass Tuesday night and Wednesday as it moved westward. 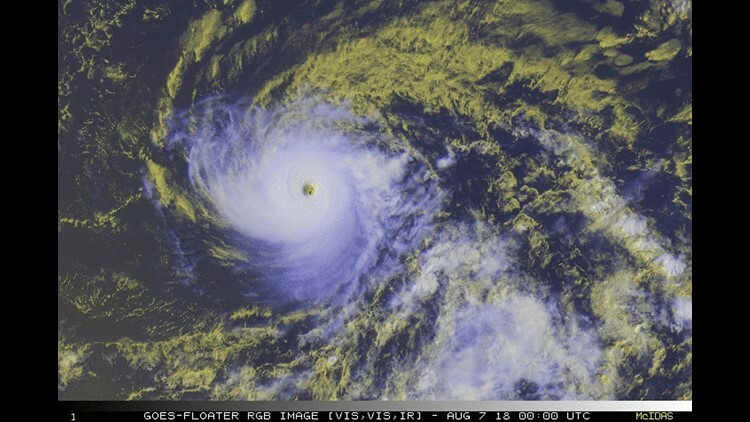 A tropical storm watch has been issued for the Big Island of Hawaii as Hurricane Hector on Tuesday kept churning west across the Pacific as a powerful Category 4 hurricane. Two other systems – Hurricane John and Tropical Storm Kristy – also swirled in the Pacific west of Mexico. The center of Hector will pass about 200 miles south of the Big Island on Wednesday, according to the latest forecast from the Central Pacific Hurricane Center in Honolulu. However, tropical-storm-force winds and pounding, dangerous surf are possible late Tuesday and Wednesday. "Very rough surf is expected to impact mostly south- and east-facing coastal areas of the Big Island," AccuWeather meteorologist Dan Kottlowski said. As a precaution, Hawaii County officials closed three beaches on the Big Island, according to Hawaii News Now. Beachgoers are warned of strong breaking waves and currents that will make swimming difficult and dangerous, the news site said. As of 5 p.m. ET, Hector had winds of 130 mph and was moving to the west at 16 mph. It was located about 470 miles east-southeast of South Point, Hawaii. The storm will continue moving west after it passes by Hawaii. 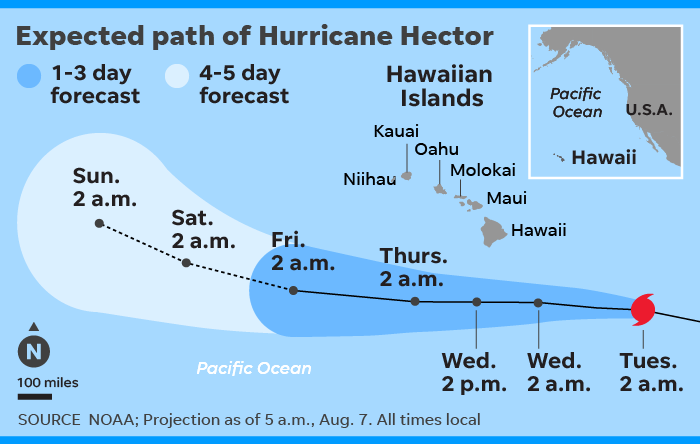 "There is a reasonable chance that Hector will survive to cross the International Date Line early next week," said AccuWeather meteorologist Steve Travis. "If it does, it will become Typhoon Hector." West of Mexico, Hurricane John was forecast to strengthen into a major hurricane while heading to the northwest parallel to the shore. The National Hurricane Center said it was likely to peak as a Category 3 hurricane before starting to weaken and turn out to sea as it passes west of the Baja California Peninsula late in the week. Far out to sea was newly formed Tropical Storm Kristy, which had sustained winds of 50 mph and could become a hurricane. It will not affect any land areas. The active season in the Pacific contrasts to the relatively quiet season in the Atlantic. On Tuesday, Subtropical Storm Debby formed in the North Atlantic Ocean. Debby poses no threat to land, the hurricane center said. Debby is the fourth named storm of the 2018 Atlantic hurricane season. The National Oceanic and Atmospheric Administration will release its updated mid-season hurricane forecast on Thursday.